Earlier in September, The Addis Clinic received a case from a clinical officer in rural Kenya describing a young woman who was bitten by an unknown snake. 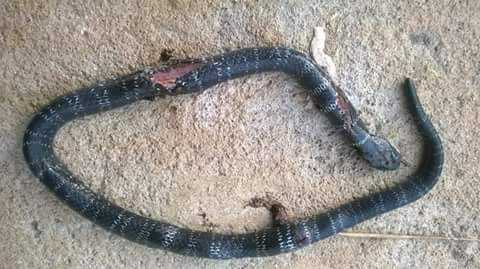 The referrer needed assistance from The Addis Clinic for two things - identifying the snake which had bitten the woman, as well as guidance on how to care for the bite. This was the first snake-bite case that we ever received and we immediately turned to our large network of physicians and supporters for assistance. It was important to first identify the snake, as that would guide the care and treatment of the patient. We shared the picture with our supporters on social media and were immediately flooded with connections to experts who quickly identified the snake as an East African Garter Snake. This request for help had over 5500 views on Facebook! We were happy to learn that while venomous, a bite from this snake has never been known to be fatal, and there is no anti-venom prepared or required for this type of injury. After identifying the snake, we quickly allocated the case to a physician with experience working in the East African region, and she gave the local clinician expert advice on how to care for the bite wound as well as what to look for as possible complications and how to care for those complications. Furthermore, she provided access to a great reference for practicing medicine in low-resource settings that this clinician will no-doubt find a useful resource not only for this case but many future cases as well. According to the snake experts we were connected with, bites of this kind are very rare and not well documented. The experts have remained actively involved in the case over the last two weeks, interested to follow up on the woman’s condition - which we are excited to report is excellent. Even a few days after suffering the bite she was only experiencing mild swelling and minimal pain. This case truly showed the ability of asynchronous telemedicine to quickly provide assistance and feedback to clinicians, and it was truly a team effort as we worked to get this young woman the answers and care she needed.